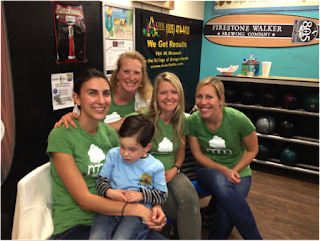 Five Mindful Munchkins and their Mothers raised $2135 for Transitions Mental Health Association and participated in the 33rd Annual Bowl-athon on March 8. This is the second year that this group of kids and moms bowled and raised money for mental health. 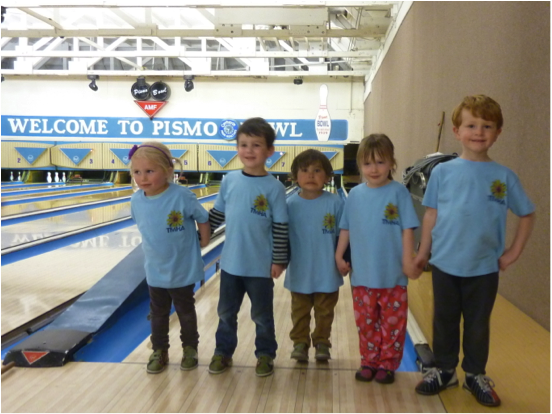 The kids were issued mini bowling shoes and matching shirts with their names on back, and they pretty much stole the show at Pismo Bowl! They had a great time “bumper” bowling, watching the pins fall, racing to the magic ball return, and cheering each other on. Transitions-Mental Health Association is a nonprofit organization dedicated to eliminating stigma and promoting recovery and wellness for people with mental illness through work, housing, community and family support services. TMHA operates 27 programs, and the Bowl-athon primarily funds the “SLO Hotline” program, the County’s only 24/7 crisis line.